Stanza. Responsive Facade. Trondheim, Norway. 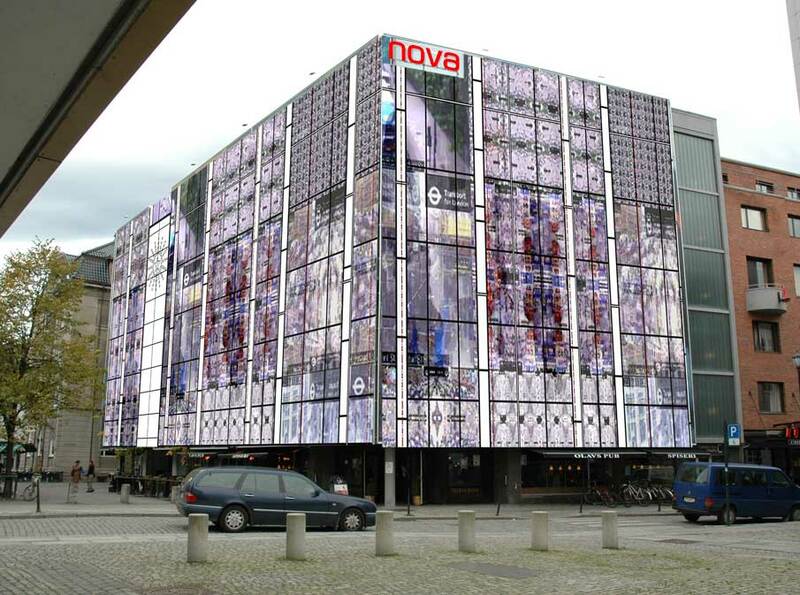 The facade presents the emotional real time state of the city of Trondheim is by using live data, and CCTV images to represent the Nova Building as a living breathing entity. Stanza's project which has won the Nova Folkets Hus facade international juried competition in 2010. This Stanza facade utilizes, electronic art, new digital media, interactive technology, dynamic real time solutions, and networked space to create responsive architecture that reflects the emotional real time state of the city of Trondheim by UK artist Stanza. This responsive architecture links the culture of AOF Nova building to the city of Trondheim, Norway. The Nova building will become the focus and the centre of a new social space harvesting data and information from across the city and later linking up to other cities across the world and more and more connected cities. The facade presents the emotional real time state of the city of Trondheim is by using live sensor data, and CCTV images to represent the Nova Building as a living breathing entity. This vision integrates the Nova building within the city, via virtual means and locates it within the global online network. We are literally putting the building on the internet and at the centre of a new social space. This new architecture uses open source data createing a new virtualised space that reflects on deeper social questions about public buildings that are key to our understanding of the world in the 21st century. This proposal is matched by a future vision to create an energy efficient facade, where architecture, technology, and art interact. The facade will become an innovative attraction in the city integrating live data, the city and the public. 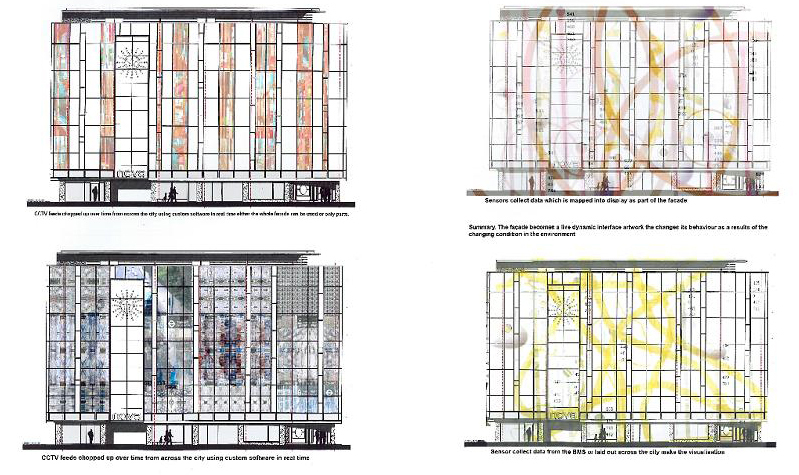 The building will act as an identity marker for the city in general but also internationally. The facade will be future proofed and adaptable to change in response to new needs and desires, this will be achieved by making the hardware open to future use by other artists. The facade aesthetics will provide the building and surrounding area with a sense of identity and represent a positive contribution to the urban landscape. 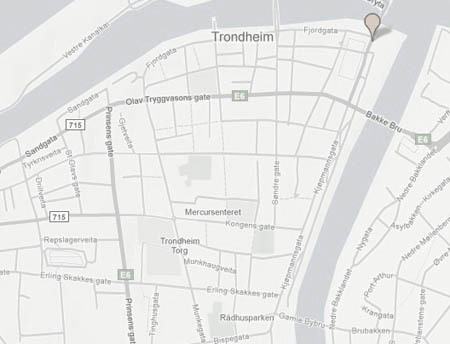 It will do this by utlilsing data in real time from the city of Trondheim. The outputs from the online interfaces and online visualizations have been realized as real time dynamic artworks as diverse as installations, and real objects, made out of new display materials back in physical space, and in this case the building itself. I my work I create new metaphors relevant to the experience of the city and the environment of the city by using real time data. The patterns we make, the visual and imaginative interpretations we give to real world events, are already being networked into retrievable data structures that can be re-imagined and source for information. These patterns disclose new ways of seeing the world. The value of gathering and re-presenting this data in artistic form, and then analyzing its impact and influence, lies in making meaning accessible to a wider audience. From the moment you walk in the building you interact with the space and the architecture. - As you step away from the building and view it from a distance the building becomes a whole integrated media experience. The use if EFTE and leds allows this possibility for the building to become invisible and become a media sculpture. - This media sculpture can be presented on all facades, on one facade, or on selected areas. The final result is a mix of leds and /or ETFE but remains true to the core artistic concepts of live data from the building and the city of Trondheim. - The artistic concepts is also scalable based on the number of sensors that can be used across the city or the number or CCTV feeds and whether to use both together ( ie live data and live CCTV). - This scalability is defined by ambitions and budget for the building costs and artistic production budget.